While going for a training run, Leo suddenly finds himself falling through an endless void. Leo suspects that he’s suffering after effects from his recent encounter with Renet and Lord Simultaneous. Leo eventually finds himself in what appears to be feudal Japan. Before he can ponder his whereabouts too thoroughly, Leo is besieged by a gang of “rough and tough outlaw ronin” who just happen to be anthropomorphic animals. They attack Leo in order to steal his money and a massive brawl follows. Not far away, the rabbit bodyguard Miyamoto Usagi is once again pestered by the Neko-Ninja Clan, who intend to take their foe out once and for all. A battle ensues, naturally. As Leo fights the ronin and Usagi fights the Neko-Ninja, their paths eventually cross. With all their opponents wiped out, both Leo and Usagi mistake one-another for an enemy. As they charge each other, Leo vanishes into thin air, leaving Usagi to smash headfirst into a tree (shouting his distaste for all ninja to the Heavens). Leo, meanwhile, reappears in April’s apartment in New York, where he crashes headfirst into his brothers. Leo tries to explain that he was fighting a rabbit, but no one will believe him. *Leo met Renet in TMNT (Vol. 1) #8. *Leo will meet Usagi a second time in “The Crossing”. 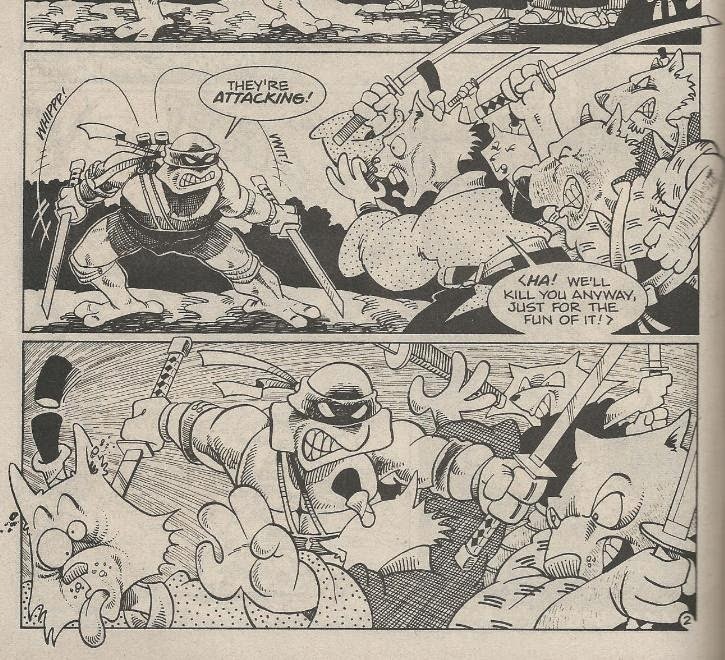 *These Usagi Yojimbo crossovers will be acknowledged as Mirage canon in TMNT (Vol. 4) #30. *Prior to this, Sakai drew a TMNT/Usagi pin-up for Donatello (microseries) #1. *This story was collected in the Usagi Yojimbo Book 3: Wanderer's Road trade paperback and the Usagi Yojimbo Special Edition hardcover collection by Fantagraphics. *This story was reprinted in the hard cover edition of TMNT/Usagi Yojimbo #1 in September, 2017. *This story was reprinted alongside "The Treaty" for the pack-in comic that came with the San Diego Comic Con 2017 Edition Usagi Yojimbo action figure. The comic used a colorized version of the pin-up from Tales of the TMNT (Vol. 2) #25 as the cover art. 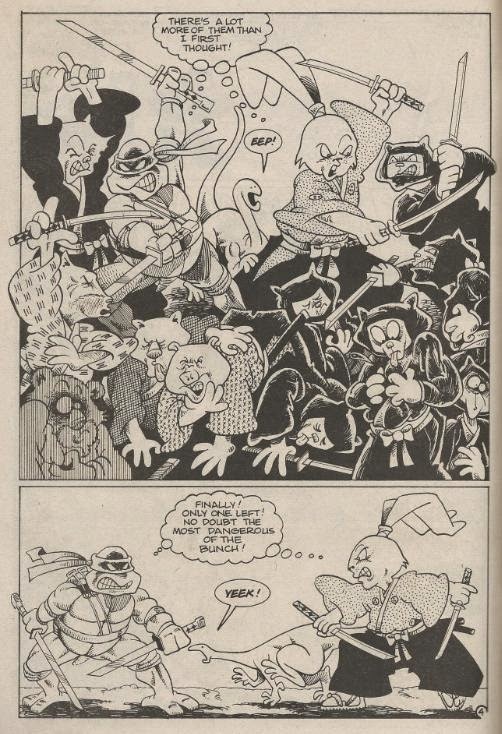 I have to confess that I haven’t read nearly as many Usagi Yojimbo comics as I should. I have absolutely no excuse to get myself off the hook for this. The series is almost completely episodic, meaning every issue is a perfect jumping-on point for new readers. I do indeed own a handful of them, in no particular order spanning the numerous volumes and publishers from the decades the series has been in print, but I just don’t feel like I’ve really given the series the dedicated read-through it obviously deserves. I’ve enjoyed everything I’ve read and I like Miyamoto Usagi as a character. His appearances in the cartoons were always a lot of fun (the 4Kids series more-so than the Fred Wolf series) and I’ve owned both the 80s and 2003 versions of the Playmates Usagi action figure (though Space Usagi always eluded me). I just need to grab some of those graphic novels and devote an entire afternoon to em. That being said, I do happen to own all six TMNT crossover issues and they actually manage to succeed in telling a pretty offbeat and compelling storyline (culminating in the three-part “Shades of Green” story arc). This first crossover, published in the tribute special “Turtle Soup”, is modest enough. Six pages that amount to little more than the two characters appearing in the same shot. 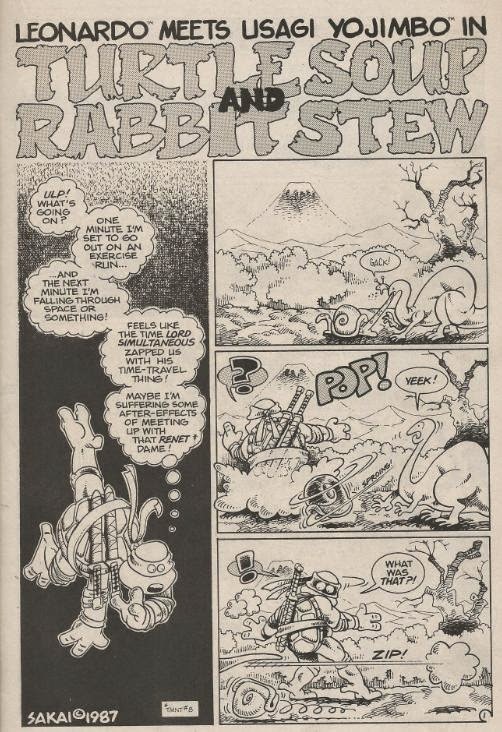 Sakai’s charming art style is in full form, with “Turtle Soup and Rabbit Stew” hitting upon all the usual Usagi Yojimbo tropes (I’ve only read a dozen issues total and I already know em all). You know, like cute little confused dinosaurs and characters having skull and cross-bone thought bubbles when they die. That sort of stuff. The story unfortunately ends just before Leo and Usagi can throw down, but at six pages, what were you expecting? Future installments in the “story arc” (if you can really call this collection of guest strips a “story arc”) would eventually give the people what they want. The "kindred spirits" angle in regards to Leo and Usagi is given a subtle start with this story, as Leo’s and Usagi’s battles mirror one another. I have to say, though, that the idea of them being two peas in a pod was only ever really done justice in the 4Kids cartoon series. But then, you know; this “story arc” is comprised of three guest strips and a three-part crossover in the Usagi Yojimbo comic. You can’t expect too much.